A visual guide to herbs and spices in their many forms, with suggestions for use. Beautiful, fragrant basil is prized throughout the world. It is used especially prominently throughout the Mediterranean and in Thai and Vietnamese cuisines. It is the key ingredient in Italian ​pesto, a thick sauce made of basil, garlic, pine nuts, and olive oil, and in the similar French pistou. 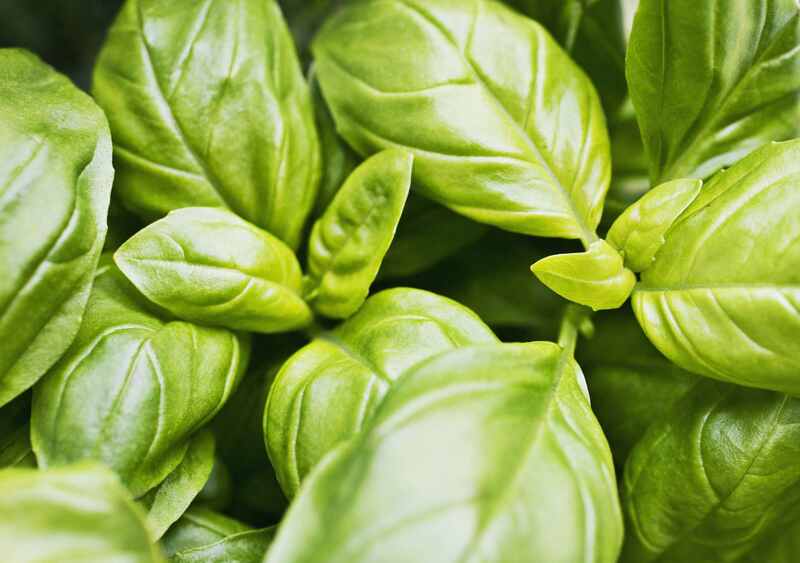 Basil is a great addition to soups, salads, and tomato sauces. It's also a great addition to fish, chicken, and cheese dishes. Bay leaves hail from the Mediterranean, and are important in Greek, French, and Italian cookery. They are most readily available in dried form, usually as whole leaves. One or two leaves will add flavor to soups, stews, sauces, gravies, and stocks, and the leaves can be easily removed before serving. Crumbled or ground bay leaves work well in seafood, meat, or poultry dishes, and in bread stuffings. Pepper is one of the most ubiquitous spices in the world, and black pepper is perhaps the most commonly used variety. Though pepper hails from India and grows only in hot climates, it was so highly prized by ancient spice traders that it now features in virtually every cuisine. To showcase pepper's pungent bite, try using it to encrust steak, salmon, or goat cheese, or use it generously in vinaigrettes. For best flavor, skip the pre-ground pepper, and invest in a pepper grinder. Available in whole pod, seed, and ground forms, cardamom is a highly perfumed spice. Especially important in Indian and Arab cuisines, cardamom has both savory and sweet applications. It is a key ingredient in the Indian spice blend called garam masala. In Arab countries, it is also used to flavor coffee, tea, and pastries. A touch of cardamom is great in carrot dishes, in spice rubs for salmon, and in vanilla or chocolate cakes, cookies, and puddings. Prized for its calming properties, chamomile is prized as a sleep aid and skin soother. Chamomile is said to help aid digestion, and many find it effective against nausea, heartburn, and indigestion. Spice lovers around the world rely on chile peppers to add a kick to their cuisine. There are many varieties of chile, and their intensity ranges from mild to super-fiery. Chiles are important in Central and South American, Caribbean, Mexican, Asian, Indian, North African, Middle Eastern, and Regional U.S. cuisines. Chiles also have a long history of medicinal use, and studies now demonstrate their anti-inflammatory properties. Warming and fragrant, cinnamon is one of the world's oldest known spices. In the US, its scent is so associated with the comforts of home that sellers are advised to bake something with cinnamon during open houses. Americans and Europeans use cinnamon most often in sweets, baked goods, teas, hot cocoa, and coffees. But in India, North Africa, the Mediterranean, the Middle East, and Caribbean regions, cinnamon is used in savory dishes as well. Experiment with cinnamon in vegetables, stews, soups and rice dishes. Also, be aware that in the US, bottles labeled cinnamon may actually contain a similarly-flavored spice called cassia. True cinnamon comes from Sri Lanka, so look for bottles labeled "Ceylon Cinnamon." Strange as it may seem, coriander seeds, which are considered a spice, come from the cilantro plant, which is used as an herb. Stranger still, coriander has a sweet, clean, herbal fragrance that in no way resembles cilantro. Coriander is used in the Indian spice blend called garam masala and is often used in chutneys and curries. It is also a popular addition to Middle Eastern and certain Asian cuisines. Coriander has a nice affinity for citrus, so try it in dishes that employ orange or lemon juice or zest, such as salads or fish dishes. Cumin's pungent aroma is instantly recognizable to lovers of Indian, Mediterranean, and Middle Eastern cuisines. Available as whole seeds or ground spice, cumin lends a distinct flavor to curries, hummus, and falafel. Cumin is a good addition to grilled meats, bean dishes, and vegetables. Curry powder is a blend comprised of spices native to India. In truth, India's vastly varied regional cuisine has given rise to countless such blends, called masalas. But the curry powder (so dubbed by British colonialists) most familiar to Westerners is generally a mix of turmeric, paprika, fenugreek, coriander, pepper, cumin, ginger, celery seed, cloves, caraway, and red pepper. Curry powder may be most associated with Indian cuisine, but it also has an affinity for Southeast Asian and Caribbean cuisines. Dill has a fresh, distinctive aroma that is especially prized throughout Europe and the Mediterranean. Its flavor brightens creamy or salt-cured foods, such as cheeses or smoked fish. Both the dried seeds and fresh herb are integral in pickling. Try dill in omelets, with potatoes, baked into quick bread or tossed in salads. Mediterranean in origin, there are hundreds of varieties of mint, which now grow throughout the world. Mint is used widely in Greek, Middle Eastern, North African, Indian, and Thai cuisines, where it's inclusion in savory dishes helps offset spicy notes. Rosemary has an almost pine-leaf like appearance, and a bracing, herbal aroma. The mint relative has a long history of both medicinal and culinary use and was believed to be particularly beneficial for memory enhancement. Though native to the Mediterranean, rosemary cultivation spread to Europe and America, where it grows well. The herb pairs well with roasted vegetables, meats, and poultry, grilled fish, and cheese. It is also an excellent enhancement in rustic bread. Traditional bowl of Moroccan Ras el Hanout. Ras El Hanout means "top of the shop," in Arabic because a merchant's best spices would go into this North African spice blend. Ras El Hanout means "top of the shop," in Arabic because a merchant's best spices would go into this North African spice blend. Ras El Hanout has no set recipe, and the most complex versions may contain over 50 spices that are toasted before grinding.